WASHINGTON — On his first foreign trip since taking office nearly three months ago, NASA Administrator Jim Bridenstine traveled to Israel this week to meet with the country’s prime minister and other officials. Bridenstine’s two-day visit to Israel, not announced by the agency until after he arrived in the country, highlighted NASA’s good relationship, but only modest cooperation, with Israel’s space agency and industry. 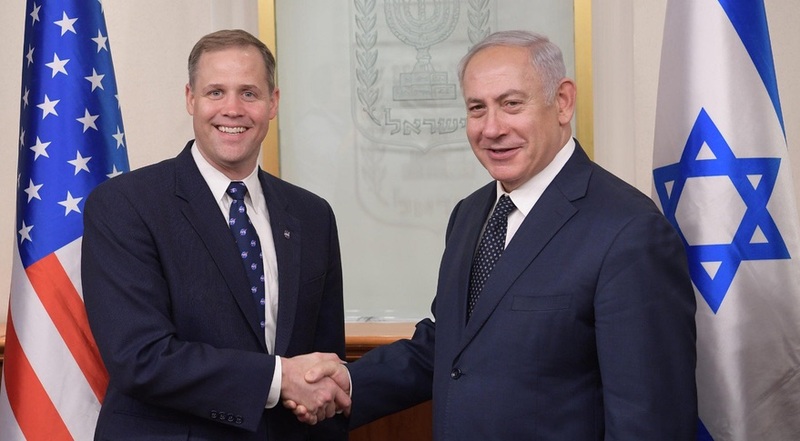 According to a readout of his trip provided July 13 by Megan Powers, NASA press secretary, Bridenstine met with Israeli Prime Minister Benjamin Netanyahu “to discuss the strategic importance of continued close cooperation in civil and commercial space.” He also met with the American ambassador to Israel, David Friedman, to discuss potential Israeli cooperation with NASA on exploration activities. NASA’s cooperation with Israel has existed at a relatively low level compared to other major spacefaring nations. The agreement noted that Israel is working with NASA and the German space agency DLR on an experiment called Matroshka AstroRad Radiation Experiment (MARE) that will fly on the Orion spacecraft on Exploration Mission 1, a uncrewed test flight. MARE will provide a “tissue equivalent assessment” of radiation astronauts on Orion would be exposed to in cislunar space as well as study the effectiveness of an Israeli-developed radiation shielding vest. Bridenstine appeared to open the door to flying an Israeli astronaut on a future mission. The Israeli news agency JTA reported July 13 that Ofir Akunis, Israel’s minister of science and technology, expressed interest in sending an Israeli astronaut to space on an unspecified mission, and that Bridenstine responded that the agency would consider the request. One Israeli astronaut has flown in space to date: Ilan Ramon, who was part of the crew of the shuttle Columbia on the STS-107 mission in 2003. He and his six crewmates died when the shuttle broke apart during reentry. Bridenstine also met with SpaceIL, the former Google Lunar X Prize team that is continuing to develop its lander even though the prize purse expired in March. SpaceIL announced July 10 that it is planning to launch its lunar lander as a secondary payload on a SpaceX Falcon 9 in December, deploying into a supersynchronous transfer orbit that it will gradually raise until it can maneuver into lunar orbit. SpaceIL said their planned landing date is Feb. 13, 2019. From Israel, Bridenstine is scheduled to go to the United Kingdom, where he will attend next week’s Farnborough International Airshow outside London. At the event Bridenstine will “meet with leadership from a number of space agencies throughout the world and company representatives from the commercial space industry,” Powers said in her readout of the trip.